One graduate, who completed 15 courses taught by Ryerson University faculty, was a former entertainment manager for Madonna. She argued in class that Prussian philosopher Immanuel Kant's view of art was better than that of David Hume, the Scottish philosopher. Kant said art was based on intention, Hume said it was skill. And the benefits go beyond presence. Participation in higher learning can also temper the loss of cognitive function associated with aging and Alzheimer's disease. Gill Livingston and his team who lead the Lancet Commission on Dementia have shown that resilience can help slow the progression of dementia or delay its onset. The idea underlying resilience is a concept called cognitive reserve. Lifestyle factors such as diet and fitness—and also learning—increase cognitive reserve. Higher cognitive reserve means fighting against loss of memory. Over the past four years, Ryerson University, in partnership with Baycrest Health Sciences, has been offering up to 20 courses a year to seniors. Some have dementia, some don't —they sit side by side in the classroom. The key is engagement —optimizing learning to reduce social isolation and increase self-esteem. These offerings are not "edutainment," but rival the content of real university undergraduate offerings. What is different is that the students do not complete assignments. They are recognized for making the effort to attend. One student with advanced dementia, but still coherent, said "I have trouble remembering things and this is the highlight of my week, so don't YOU forget to bring me here next week!" This kind of comment is frequent. And the very idea that organized learning led this patient to perform a "metacognitive act" —knowing she had dementia and needing to compensate —is impressive in itself. The Lancet Commission report also explored the role of early childhood education in the development of dementia. The data suggests that lack of education leads to higher incidence of dementia due to decreased cognitive reserve. This points to the value of educating seniors over long periods of time —not only for those with dementia, but for those who are healthy and at risk for dementia. George Rebok's 2014 landmark study on the effect of education for seniors tracked participants for a 10-year period, exploring many aspects of cognitive function. Small effects were seen in increased ability to think and more impressive effects with respect to personal hygiene, self-efficacy and other measures of well-being. Learning seems to provide both social connectedness and mental stimulation, possibly leading to resilience through increasing cognitive reserve. Reasoning and speed of thinking improved in Rebok's outcomes, but not memory. However, this is about to change. This summer, the Centre for Aging and Brain Health Innovation (CABHI) awarded a grant to our team —to investigate the use of learning technologies such as streaming media compared to face-to-face sessions in people with dementia and those at risk of developing it. 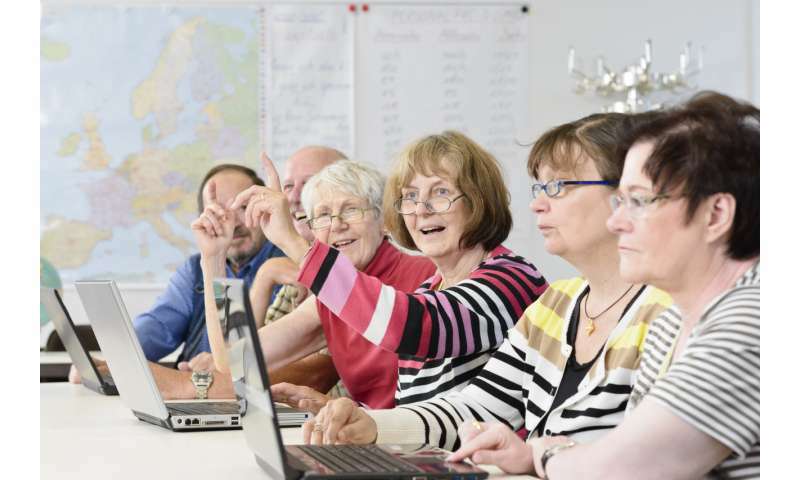 The goal of the program is to create greater access to lifelong learning opportunities for older adults irrespective of their place of residence —be it long-term care or in the community. The clinical studies begin in September 2018 and we will report on our data in the late spring of 2019. Socrates spoke of an idea called "eudaimonia," which means "flourishing in life." Too much pleasure and we wilt. Too much purpose and we stress out. But when pleasure and purpose are both high, we achieve this "eudaimonia" state, according to Deborah Fels, one of Canada's leading experts in aging and accessibility. Do you know someone who has dementia?